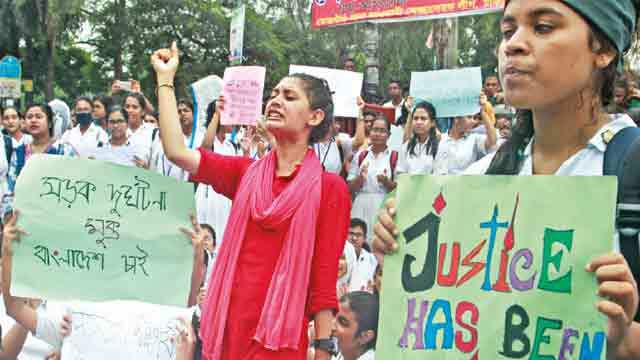 Dhaka, Aug 30 (Just News): Bangladesh’s main opposition party, in disarray since its leader Khaleda Zia was jailed in February, received an unexpected boost this month - days of protests by tens of thousands of students that have shaken the government ahead of a December election. What began as an outpouring of anger over the failings of an unregulated transport industry after a speeding bus killed two students in Dhaka, quickly escalated into the widest anti-government protests in the nation in years, providing a focus for discontent with what critics see as increasingly authoritarian rule. Alam, who is a voter in his hometown in Barishal, in southern Bangladesh, said he would vote for the first time this year - for Khaleda Zia’s Bangladesh Nationalist Party (BNP). Analysts say such views are on the rise around the country. The protests, which saw students directing traffic for days in the choked streets of Dhaka, demanding to check drivers’ licenses and vehicles’ roadworthiness, have put prime minister Sheikh Hasina's ruling Awami League on the defensive in the run-up to an election. A slogan is written on the body of a student as he takes part in a protest over recent traffic accidents that killed a boy and a girl, in Dhaka. Photo: ReutersThe government has blamed the BNP for inciting the students. But heavy-handed policing of demonstrations and a wave of arrests fueled accusations that free speech is increasingly being curtailed. The government said its actions were necessary to restore order. The protests erupted after the driver of a speeding private bus lost control in a congested part of Dhaka and plowed into a bus stop, killing two students. Most private bus drivers in Bangladesh do not get paid a salary, but earn commission for the number of people they pick up, leading them to race each other for passengers. Sayed Nasirullah, an assistant commissioner with the Dhaka metropolitan police, said at least 20 students had been arrested on suspicion they spread “rumors and propaganda” on social media. Social activist and photographer Shahidul Alam, who had posted comments that a student wing of Hasina’s ruling party was trying to attack the protesters, was held on similar charges. The BNP hopes it has found the lifeline it needed.